United’s first-team squad requires major surgery in the close season. And The Journal understands it is not just out-of-contract and on-loan players who are under risk. Centre-back Taylor, who was heavily linked with a loan move to Queens Park Rangers during the January transfer window, is understood to be one of a number of senior players who will be under scrutiny between now and the end of the campaign. Taylor and his agent Willie McKay made it clear before the New Year window the player wanted more first-team football when he was out of the team. But his performances since returning to the side have not always justified those calls. Newcastle manager Alan Pardew will face a potential crossroads moment this weekend with Fabricio Coloccini coming back from a long-term injury. That will see one of Taylor or Mike Williamson demoted to the bench to make way for the returning captain. Coloccini’s absence has been keenly felt by Newcastle, who have shipped ten goals in their last three games without scoring. They have missed his leadership and his defensive solidity and that has prompted a re-think about Newcastle’s future direction. If Taylor is back on the bench it will go a long way to clarifying United’s thinking about their defensive pecking order. There are a number of teams interested in the 27-year-old, with West Ham United – managed by former Newcastle boss Sam Allardyce – and Hull City, where Geordie Steve Bruce is in charge, both understood to have been monitoring the defender before the January transfer window. However, he would prefer to stay at St James’ Park and fight for his place. 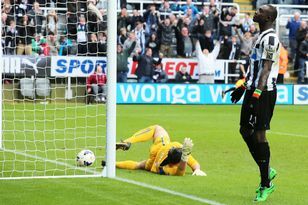 Despite Mapou Yanga-Mbiwa’s prolonged stint on the sidelines his future is not understood to be under consideraton with Newcastle believing he will come good in time. Taylor’s future, though, is in sharper focus because the defender has a lucrative, long-term contract. Newcastle already face a big summer which will see them have to make decisions on several key players. On-loan striker Loic Remy is attracting interest from Arsenal, while there have been genuine doubts about whether Hatem Ben Arfa will leave the club in the summer. Pardew is said to be unimpressed by the midfielder’s contribution since he returned to the United team. There are also doubts about fringe members of the squad like Sylvain Marveaux, who was reported to be the subject of Pardew’s ire following the recent defeat to Tottenham. Meanwhile, the club brushed off talk of Demba Ba re-signing in the summer. A story carried by Footballdirectnews, a website owned by Mike Ashley’s Sports Direct company, claimed the Senegal striker was a target – but club insiders have dismissed that. As the club face a potential crossroads close season, they have announced a series of price cuts and freezes which they claimed were aimed at rewarding the loyalty of their supporters. Finance director John Irving said: “Keeping football affordable for supporters continues to be a hugely important aim at Newcastle United, so we are delighted to announce our ticketing plans for the 2014/15 season. “Supporters on long-term price-freeze deals continue to show incredible loyalty to their club so it is only right their commitment continues to be acknowledged and rewarded.